Firstly, lets deal with why a lot of women resist resistance or weight training. The main barrier I come across is the fear of getting bulky. For the vast majority of women this simply isn’t possible. Men and women have different hormones. The main one that makes a difference to body type is testosterone. You can think of testosterone as the yeast in bread. A bread without yeast just won’t rise in the same way that a female body, that only has a tiny amount of testosterone, just won’t grow like a mans body. Any other questions, feel free to ask them in the comment section below. OK, so here’s a top 10. It will improve the quality of your life. Strength training will make you stronger, making it easier and more enjoyable to do every day stuff like play with your kids or grandkids, carry stuff, gardening and walking up steep hills. It’ll improve your posture and overall shape and tone. As your back and overall strength and muscle balance improves you will find yourself effortlessly more upright and spine straighter. It’ll preserve muscle wastage. After 40, as your hormone balance changes you can start to see your muscle mass slowly disappear. The way to prevent this to a very large degree is proper strength training. It can prevent osteoporosis. Typically, calcium intake has little to do with osteoporosis. The US has the highest dairy intake and the highest incidence of osteoporosis for example. What makes a difference to keeping bones strong is the same thing that keeps your muscles strong. Load baring exercise. Running is also excellent for keeping leg and hip bones strong. It is good for your heart. Strength training will reduce bad cholesterol, body fat and blood pressure. All of which are major indicators for overall health and heart health. It can be good for your cardiovascular fitness. Doing full-body, compound exercises like squats, deadlifts and step-ups will dramatically raise your heart rate as your body works hard to pump oxygenated blood to the many muscles shifting heavy weights. This is will have a positive effect on your overall cardiovascular fitness. It’ll build physical, mental and emotional resilience. Regularly facing the challenge of strength training and successfully completing sessions week in week out builds a solid practice in your life. This practice will teach your system that you are capable of facing challenge and that you have the self-worth to stick to your commitments and take care of yourself. The value from this cannot be underestimated. It can cure and prevent back pain. I say most back pain is due to weakness in the muscles supporting the back. This has certainly been my experience. I have a congenital back condition that means that means my back should be unstable. However, I have practically healed it with strength training. The more muscle you have the more calories you burn at rest. Muscles are the main way your body burns calories. The more muscle mass, the higher your metabolism. Muscle is also better at keeping your warm than a layer of fat. You Will Reduce Your Risk of Diabetes. The more muscle you have, the more insulin receptor sites you have, and the more sensitive they will be. Increased muscle tissue helps to prevent diabetes and metabolic syndrome. 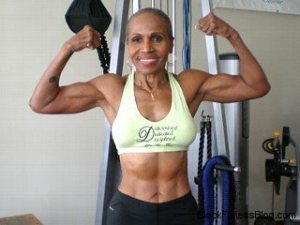 Ernestine Shepherd – world”s oldest bodybuilder at 75 years old. Wow she looks amazing for her age! Some people don’t even make it to that age. I will have to link to this page from my site – this is inspiring. 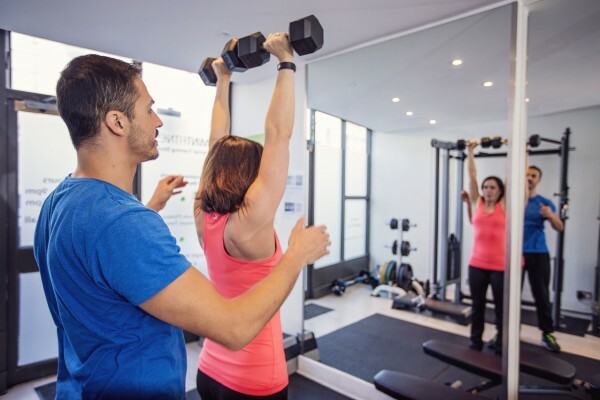 The best way is get a personal trainer to take you through a programme that you then can get on with at home safe in the knowledge that you’re doing everything correctly. There’s also lots of great resources on Youtube!